Announcing Kanika's alter-ego, Kathy Lynne Marshall, who has begun writing genealogy and art books under the Kanika African Sculptures and Books Publishing Company. My newly-released "THE ANCESTORS ARE SMILING!" is available from this website (for an autographed copy) or from Amazon.com (no autograph). The Ancestors Are Smiling! 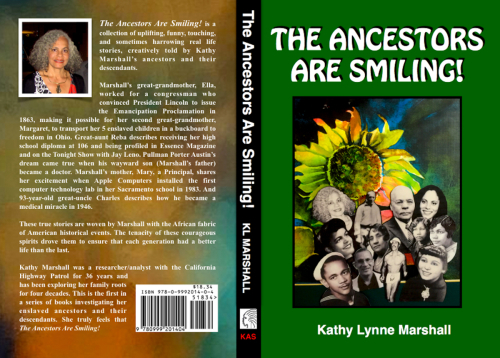 is a collection of uplifting, touching, funny, and sometimes harrowing real life stories, creatively told by Kathy Marshall’s ancestors and their descendants. Marshall’s great-grandmother, Ella, worked for a congressman who convinced President Lincoln to issue the Emancipation Proclamation in 1863, making it possible for her second great-grandmother, Margaret, to transport her 5 enslaved children in a buckboard to freedom in Ohio. Great-aunt Reba describes receiving her high school diploma at 106 and being profiled in Essence Magazine and on the Tonight Show with Jay Leno. Pullman Porter Austin’s dream came true when his wayward son (Marshall’s father) became a doctor. Marshall’s mother, Mary, a Principal, shares her excitement when Apple Computers installed the first computer technology lab in her Sacramento school in 1983. And 93-year-old great-uncle Charles describes how he became a medical miracle in 1946. These true stories are woven by Marshall with the African fabric of American historical events. The tenacity of these courageous spirits drove them to ensure that each generation had a better life than the last. Kathy Marshall was a researcher/analyst with the California Patrol for 36 years and has been exploring her family roots for four decades. This is the first in a series of books investigating her enslaved ancestors and their descendants. Marshall truly believes that "The Ancestors Are Smiling!" A continuation of "The Ancestors Are Smiling!" 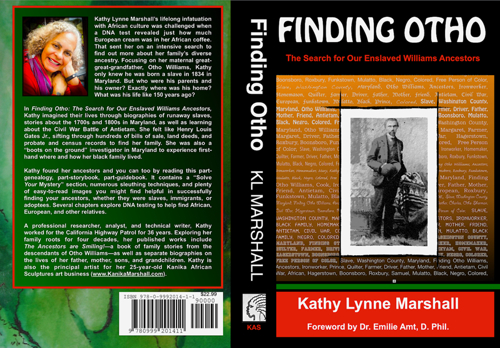 saga, "Finding Otho" is part storybook, part research book, and part guidebook about Kathy Marshall's genealogy adventure to find out about her great-great-grandfather, Otho Williams, who was born a slave but died a free man in Maryland. Her intent is for others to be able to gain hints and tips on how they, too, may find valuable information about their ancestors. She would love to encourage others to also leave a written legacy about their family. To buy this book, click anywhere on the book cover, then select "Choice #5" the Book shipping option, when prompted for shipping cost.